Ideal for prayer and meditation as well as casual listening and relaxation, The Chants of Angels features timeless melodies, expert vocal performance and beautiful choir arrangements. Selections include antiphons, psalms, hymns and much more. Based on ancient melodies and texts of the early church, The Chants of Angels offers listeners an intimate experience of the angelic realm. Including the Archangel Gabriel's announcement to the Virgin Mary and our own prayers, each of the 18 Gregorian chants presents the angels and their stories in new ways. Enter into the comfort and peace of the angels with these glorious chants. Performed by the Gloriae Dei Cantores Schola, this collection is for anyone seeking to establish or deepen a connection with the angels, from those who are new to Gregorian chant to seasoned scholars. Ideal for prayer and meditation as well as casual listening and relaxation, The Chants of Angels features timeless melodies, expert vocal performance and beautiful choir arrangements. Selections include antiphons, psalms, hymns and much more. Based on ancient melodies and texts of the early church, The Chants of Angels offers listeners an intimate experience of the angelic realm. Including the Archangel Gabriel's announcement to the Virgin Mary, each of the 18 Gregorian chants presents the angels and their stories in new ways. 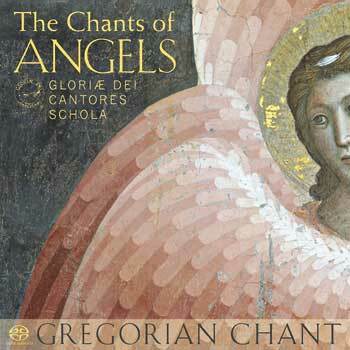 Enter into the comfort and peace of the angels with these glorious chants. Performed by the Gloriae Dei Cantores Schola, this collection is for anyone seeking to establish or deepen a connection with the angels, from those who are new to Gregorian chant to seasoned scholars.